There are many different options when it comes to mulch products for your landscaping. Mulch may or may not be something you want to consider for your garden bed areas. If you have shrub or tree beds as part of your landscaping then mulch and/or landscaping fabric will be a good choice. Landscaping fabric combined with mulch provides a great weed barrier to help keep your garden beds low maintenance. Mulch and fabric will never completely eliminate weeds from germinating but it will greatly reduce the number of weeds that will grow in your garden beds. If you have perennial or annual garden beds then you will not need or require mulch or fabric. Perennials will need open soil in order to surface each spring and annuals will require regular replanting so open or raw soil is the only option. Wood Mulch and fabric are ideal for your shrubs beds and you can choose from many options including shredded cedar mulch, large bark mulch, fine alpine mulch and died mulch that is orange or black in color. 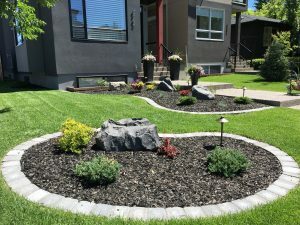 Stone mulch is quickly becoming as popular as wood mulch because it does not need replenishing, retains its colour and will not move around as much as wood mulch products. Wood mulch will fade over a few years and break down and become part of the soil so you will need to top up your mulch to keep it looking fresh and attractive and to help reduce weed growth. Stone mulch options include 20 and 40mm rundle rock, washed rock, pea gravel, montana rainbow rock, tan rock as well as many more choices. Wood or stone mulch both look great with mowing pavers or other garden borders. We can help you choose an ideal mulch that will compliment your landscaping and help keep your landscaping low maintenance.